roast at 375 for about one hour. all vegetables finely. Place into pot. Cook mixture for 20 minutes on low heat. Remove and let cool. The cookbook has a dough recipe which I forwent and instead used frozen tart shells…putting mixture into the bottom one and then pressing down the top one. Bake for around 20 minutes in a 400 degree oven. (Sometimes the top lag so you may have to put them back in for a little longer). I served this with Dwight’s Mango Chutney. 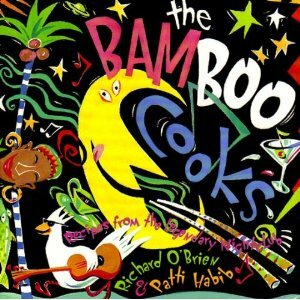 Both the patty and chutney recipe come from the Bamboo Cooks (a great but out of print cook book). This recipe comes from Antioquia in Colombia, where it is served with rice and a number of side dishes, including crisp pork crackling, bananas, avocados, and white corncakes. Stretched in this way, the quantities given here would easily serve eight. Into a large pot 2 cups of red kidney beans (not pre-soaked). Add 5 cups of a mixture made from the liquid drained from a large tin of peeled tomatoes (the tomatoes themselves are used later) and your choice of stock. Do not add salt it is said to prevent the beans softening properly. Cover the pot and put the beans to cook over low heat. (South American practice is to add a tablespoon of oil when the beans begin to wrinkle but I omitted this with no ill effects.) Continue cooking until tender; about 2 to 3 hours. Meanwhile, finely chop 2 large onions and 4 cloves of garlic and fry gently in a little oil. Add 500 g. minced meat (usually beef but take your choice, I used chicken) and fry very slowly until brown. Add the tinned tomatoes, a chopped green chile, 2 or 3 bay leaves, 2 teaspoons cumin, half a bunch of basil (chopped), 1 teaspoon cayenne pepper, pepper and salt. Serves 4-6. (January 31, 2004) From Columbia. A Moldavian stew suffused with garlic, fresh tomatoes and sweet paprika. 1. Trim and clean the mushrooms. Cut into ½ inch pieces. 2. Heat 4 tablespoons of oil in a large skillet over high heat. Add and sauté mushrooms until browned, add lemon juice and set aside. 3. Heat remaining oil in a Dutch oven over medium-high heat. Add the onion and bell pepper and cook, stirring until the onions are lightly colored, 7 to 8 minutes. Stir in the tomatoes, garlic, paprika, thyme, and fennel seeds and cook, stirring continually for 3 to 4 minutes. 4. Turn the heat down to medium and sprinkle in the flour. Add the wine and stir to blend. Season to taste with salt and pepper, then reduce the heat to low and simmer, covered for 12 to 15 minutes. 5. Add the mushrooms, stir, and simmer for 10 more minutes. 6. Correct the seasoning, sprinkle with parsley and serve. and bring to boil. Boil until tender. Drain and cool. The grate into large mixing bowl (skin and all). Squeeze whole roasted garlic cloves from skins into potato. Add the cheese, egg, and chives. Form mixture into 6 cakes each about 1 ½ inches thick. Lightly brush surface of pan with butter and add cakes. Fry, turning once, until nicely browned and heated through. 4 to 6 minutes a side. Remove excess papery skin but leave bulbs whole. Cut off the top ½ inch off each bulb, exposing tops. carving knife to expose the inside. and add water to reach halfway up the sides of the bulbs. Drizzle olive oil evenly over the tops of the bulbs. Cover tightly with aluminum foil and place in oven. Bake about 1 hour (until cloves feel soft when pressed). Put all ingredients, except oil into food processor. Process thoroughly to a mash consistency. continuing to process until the mixture thickens and emulsifies.